Rear Adm. (Ret), Sandy Adams will review the little known, and inspiring history of U.S. women’s military service alongside their brother’s in arms. Women were officially allowed to start serving in very limited roles in 1901, even before women had the right to vote. Since then, almost 3 million women have volunteered to serve in uniform. Come hear this condensed story of how women’s service in the defense of our nation has gradually led to women becoming fully integrated in the U.S. Military. Rear Adm. (ret) Adams served as a Navy officer for 34 years and retired in 2015. Originally from Michigan, she has lived in Southern CA for over 25 years. She holds a Bachelor of Arts degree from Michigan State University and a Master of Arts degree from the Naval War College. After getting her commission through Officer Candidate School in 1981 and completing Surface Warfare school, she was assigned to USS PUGET SOUND (AD 38) based in Italy as SIXTH Fleet flagship. She transitioned to the Naval Reserve at Long Beach Naval Station in units including Mobile Inshore Undersea Warfare Unit 105. 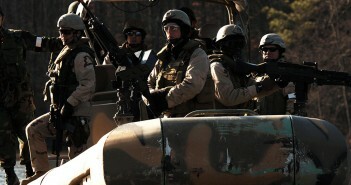 The unit was recalled to active duty and deployed to Saudi Arabia for Operations Desert Shield and Desert Storm. She served as the Commanding Officer of five units including the USS Bolster (ARS 38) reserve unit, Mobile Inshore Undersea Warfare Unit 203, and reserve headquarters for Naval Forces Japan, and U.S. Pacific Command. In 2010, she mobilized to Afghanistan where she served as the senior advisor to an Afghan Minister of Defense Lieutenant General and his staff. Her first Flag Officer assignment was as Deputy Commander, Navy Region Midwest. She then served in her final assignment as the Deputy Commander, Navy Expeditionary Combat Command which is responsible for 19,000 active and reserve Sailors including Seabees and Coastal Warfare professionals. In her civilian career Adams has held various leadership positions of increasing responsibility in manufacturing and supply chain for major companies. 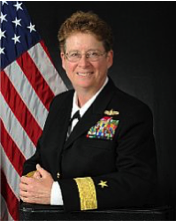 Her personal decorations include the Legion of Merit (two awards), Defense Meritorious Service Medal (three awards), Meritorious Service Medal (two awards), Navy and Marine Corps Commendation Medal (three awards), and Navy and Marine Corps Achievement medal (three awards).